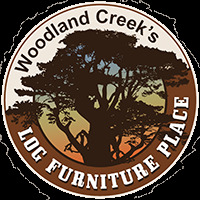 The Glacier Country Six Drawer Log Dresser is made from lodgepole pines that have been harvested from dead standing trees. The logs are hand-peeled using draw knives, leaving the cambium (inner bark) on the logs, giving a beautiful texture and color contrast to the creamy white pine logs. The rustic dresser comes finished by using an eight step professional spraying process that applies stain and lacquer for a beautiful, long lasting finish. If you like the look of this piece, be sure to check out the rest of our Glacier Country Bedroom Collection. Hand-peeled log trim & drawer pulls. Flat or Half Log drawer fronts.